This month's Cape Cod events calendar is chock-full of summer fun! In early June, future Major Leaguers take the field on opening day of the Cape Cod Baseball League's 2018 season. Later in the month, our annual Quahog Day Festival brings the much-anticipated prediction from Doug, our resident soothsayer clam, foretelling how many days of fantastic beach days we'll have this summer. 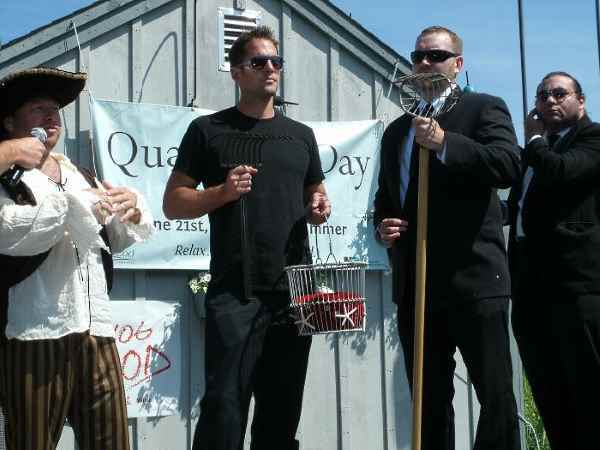 Doug the Quahog (in the basket) on stage at Quahog Day. Do you recognize the celebrity Captain of Doug's security team? That's Chris Lambton of "The Bachelorette" and HGTV fame! And that's just the beginning! Read on for my hand-picked selection of the best Cape Cod events in June. The Sandwich Women's Club's annual Touch-a-Truck Fundraiser event brings together dozens of shiny vehicles for kids (and their adult companions ;-) to touch, sit on, and learn about. How fun is it to see fire trucks, construction equipment, wreckers, emergency vehicles, pumpers, bobcats and cranes, up close and personal? Super-duper fun!! This good-time-for-all event also features a children's fair with face painting, music and dance performances, a candy drop, and live animals, plus a "Roamin' Railroad" for touring the entire event. Lunch, snacks and beverages will be available for purchase on-site at the “Truck Stop Cafe”. This don't-miss event benefits a worthy organization. So ... don't miss it! It's opening day, let the games begin! The country's best collegiate baseball players are back on Cape Cod for another season of great baseball. 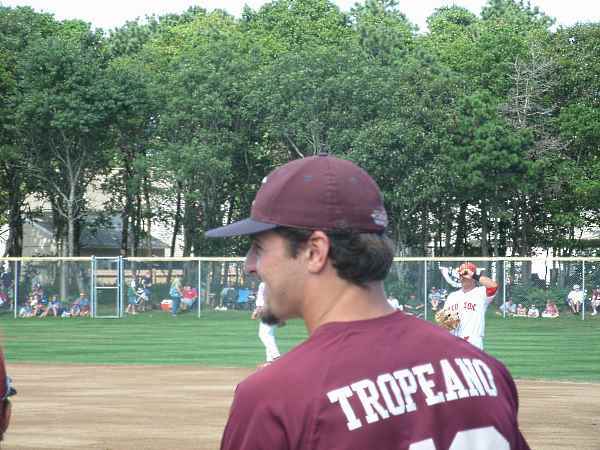 Head to a ballfield in one of 10 towns across the Cape, and you'll soon see why CCBL games are high on my list of things to do on Cape Cod on a summer evening! This gala 3-day event celebrates the arts in Falmouth and on the Upper Cape. Festival events include a Town Dance on Friday night, a special Rock Fest on Saturday night, and days filled with music, theater, dance performances, artist and crafter exhibits and sale, food and drink, and plenty of activities for the kids. The gorgeous grounds of St. Barnabas Church, adjacent to the Town Green in Falmouth, is the setting for this annual strawberry festival. Enjoy strawberry treats, lobster rolls, hot dogs, and barbequed chicken on the St. Barnabas lawn. There will also be arts and crafts vendors, a plant sale, and activities and games for kids. More than 30 exhibitors from Cape Cod and beyond gather on the grounds of the Historical Society Museum to display an array of antiques, furniture, art, pottery, glass, nautical items, and collectibles. This annual show benefits a great cause - it's a fundraiser for the Historical Society. When: June 17, 2018, 10 a.m. to 4 p.m. Here's your chance to see how wool goes from the sheep to the sweater! At historic Taylor-Bray Farm's annual Sheep Festival, visitors are treated to demonstrations of the ages-old arts of sheep herding, sheep shearing, wool spinning, blacksmithing, and open-hearth cooking. On the grounds of the 22-acre farm, you'll also meet the resident donkeys, sheep, Scottish Highland cattle and other farm animals - with petting areas for up-close visits. Haywagon rides and refreshments round out the day. Please ... human visitors only, no dogs! When: June 17, 2018, 8:30 a.m. to 2:30 p.m.
Every year on Fathers' Day, the Main Street of Hyannis is lined with hundreds of shiny autos of all kinds - plus an arts and crafts fair, food vendors, music at the bandstand, and the multitude of sights, sounds and tastes that downtown Hyannis and the Harbor area are noted for. Although it's dedicated to Dads on their special weekend, this antique and collector car extravaganza is a popular event with moms, kids and other family members, too! Usher in summer 2018 at this quirky celebration headlined by our resident "seer", Doug the Quahog. Why do I refer to him as a "seer"? Because this marvelous mollusk has talents that amaze ... the ability to predict how many weeks of great beach weather lie ahead for Cape Cod. Come see Doug, learn his prediction, and enjoy an afternoon of festivities like none other! Provincetown's rich Portuguese heritage is on full display this weekend with a wealth of entertainment including a fishing derby, capture the flag race, a festival parade, concerts, kids games, and plenty of wonderful Portuguese foods. On Sunday, a Fisherman's Mass is held at St. Peter's Church, followed by a procession to MacMillan Pier and the Harbor for the traditional Blessing of the Fleet. Cape Cod is known for spectacular private gardens. Here's your chance to tour a number of distinctive gardens in the town of Orleans showcasing diverse plantings. Ticket holders will be treated to receptions at local art galleries after the tour. When: June 23, 2018, 5K start at 9:30 a.m. Grab your running shoes and get ready to race or walk for a good cause, local fitness programs for kids. Originally begun by a small group of fitness-minded moms, this 5K now draws hundreds of racers of all ages for a run along a flat, scenic route through the village of Harwichport. The professionally timed event is followed by an after-party celebration and awards for the top finishers. Stroll through dozens of artists' tents filled with beautiful original paintings, photographs, fine art crafts, hand-crafted jewelry, and more. Live music, fun children's events, and raffles complete the day's festivities. When: June 24, 2018 from noon to 3 p.m.
One of the most anticipated events of the season, Chowder Fest serves up the best chowders on Cape Cod for our tasting pleasure. So bring your appetite, and get ready to sample the yummiest chowders you can imagine. Then cast your vote for the Best Chowder! Live entertainment on the Melody Tent stage and a special play area for the kids make this event a fun outing for everyone in the family. When: June 30, 2018, 10 a.m. to 4 p.m. Which restaurant has "The Best Sandwich in Sandwich"? That's the ultimate question to be decided during SandwichFest. Held in Sandwich, the oldest town on Cape Cod, activities at this fun summer street festival also include games for kids, a dog costume competition and parade, live music, and lots more.